Join in on the Thanksgiving tradition all year round with this fantastic slot game that will see you stuffing your face to stuff your pockets. Click here to play! Thanksgiving just wouldn’t be complete without the pilgrim hats. These iconic symbols hold the highest payout available in this game, awarding up to 2400 coins if you can gather three of them across the payline on a three coins bet. Also attempt to collect the autumn leaves. These will bring in a top payout of 160 coins. There are also triple, double, and single BARS as well as pumpkin pies to help you amass your Thanksgiving fortune. Be sure to wager the max of three coins as this will not only activate the highest paytable, but it will also turn the turkey into a bonus symbol. If you can spin in three of these across the active payline, you will trigger a bonus feature that allows you to collect even more cash! 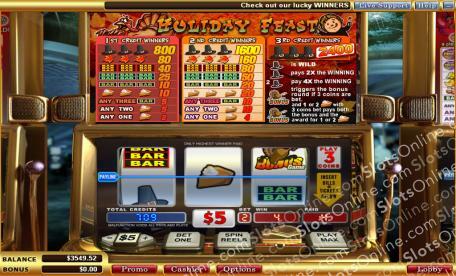 Be festive all year round with this amazing slot game. If you wager all three coins, the pilgrim hat becomes a wild. It will substitute for most other symbols to help you bring in even more wins. Wager all three coins and you will turn the turkey into a bonus symbol. Spin three of them across the single payline and you will trigger a bonus feature. During this game you will choose from some symbols to reveal your prize.